The great thing about online CRM solutions (a.k.a. hosted CRM or web CRM) is that you don't have to waste a lot of time or money messing around with them. You don't have to invest in servers or be an Information Technology wizard (or hire one!) to install the program and get it up and running. Good online CRM for small business lets you pick a CRM plan, sign up and get on with the important business of managing your client or customer relationships. This is especially important for small businesses that don’t have IT departments or maybe even a single IT wizard of their own on site. What does a good online CRM solution need? Contact management, for a start. But also, the ability to manage the sales funnel and sales forecasting. And more, such as integration with email and marketing systems. 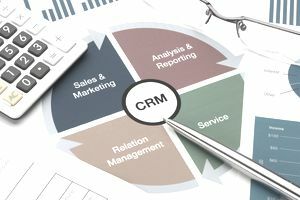 Learn more about the criteria to use to separate the CRM wheat from the chaff in What to Look For in a CRM Solution for a Small Business. And because different types of businesses need different features in their online CRM solutions, you'll find a variety of good online CRM solutions for small businesses below. All have free trials available as of this writing. HubSpot CRM - Advertised as taking only 10 seconds to install and 100% free now and forever, this is an integrated CRM that lets you easily enter new contacts, keep all their information in one place and easily move them through the whole sales process. The ability to know when a contact opens an email you've sent them is especially impressive. Insightly - If project management is a high priority for you, you might want to give Insightly a try; it offers CRM and project management in one package. One of its more interesting features is the way Insightly lets you zone in on leads and contacts. Besides being able to easily see their background, email history and details of any project they've been associated with, Insightly will also show you every social profile connected with the contact's email address. There is a free version for up to 2 people. Solve - Solve is online CRM most suitable for small businesses that do a lot of project work. It would be ideal, I think, for creative businesses such as designers, home renovators, software developers or consultants. Its secure work group feature is something that not many CRM systems out there offer. Solve CRM is a Google Cloud Premier Partner which means it's tightly integrated with G Suite. Currently, Solve costs $24 per user monthly (minimum 4 users); there is a two-week free trial. ZOHO CRM – While there is a basic free plan for up to 10 users, you'll probably want to pony up and choose one of Zoho's inexpensive plans so you can take advantage of more of its features such as sales forecasting, SalesSignals, custom reports, and marketing campaigns. Zoho provides a good variety of analytics, including custom dashboards and is integrated with G Suite, Facebook and Twitter. Really Simple Systems - Billing itself as a simple CRM system to manage a small business's Sales and Marketing all in one, Really Simple Systems has something even better going for it - excellent customer service and support. Email marketing is integrated and everything needed to manage contacts and sales is included - free for two users and up to 100 accounts. Capsule CRM – Capsule's basic nature is a large part of its appeal; with it you can manage contacts, your tasks, your calendar and your sales pipeline through a user-friendly interface. But its true value is in its ability to integrate with so many other programs. These include six-plus accounting programs through G Suite (you can access Capsule directly from Google Mail), MailChimp, Active Campaign, Wufu Forms, ZenDesk and more. Your work is always simpler when you're using a program you already know how to use. There is a free account for up to 2 users with 250 contacts. Salesforce.com Sales Cloud – SalesforceIQ CRM provides a lot of CRM for a little price ($25 USD per month). And its collaborative and mobile features are second to none. Nimble – Your work can't help but be more productive when your CRM is incorporated into your workflow - and that's what Nimble does so well. Nimble shows you everything and lets you do everything through a single window, whether you need to check your schedule or reply to a tweet. Pricing is simple, too at $15/user/month and integrations include Freshdesk, HubSpot, MailChimp, HootSuite, Constant Contact, AWeber, Freshbooks, and many more.